In addition to photos of commercial fishing in the Keweenaw the museum has many related objects used locally including scales, net, ice cutting tools, etc. One of the first ships to arrive in Copper Harbor in the 1840’s arrived with two purposes. It was to drop off some of the early explorers looking for copper. But it also was to sail to neighboring Isle Royale to see if explorers who had been dropped there earlier had found a good site for commercial fishing. Thus began the related histories of copper mining and commercial fishing in the Keweenaw. The Commercial Fishing Museum also has a continuously running DVD with movies of actual fishing in Lake Superior. The Keweenaw County Historical Society Commercial Fishing Museum is located on the grounds of the Eagle Harbor Lighthouse complex in Eagle Harbor, Michigan next to the Rental cottage and near the Eagle Harbor Lighthouse, the Maritime Museum, the Keweenaw History Museum and our Lake superior observation deck. In it one can see many displays of commercial fishing activities in the Keweenaw and also displays of the many families that fished from one generation to the next. The many photographs in the museum put a human face on the rough and risky business of commercial fishing in Lake Superior. 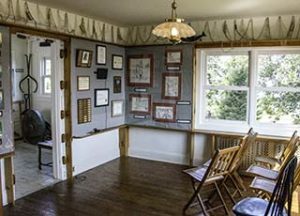 Hours & Admission – The Commercial Fishing Museum is part of the Eagle Harbor Lighthouse Complex and is open from mid-June to early October. Admission $5.00. Children free. Check the Site and Museum Schedule page for specific hours of operation.